Hi everyone!! 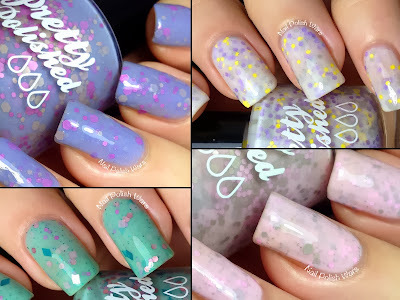 I have the Country Girl Swag Collection from Pretty & Polished for you today!! Blue Jean Baby is a soft aqua crelly with satin diamonds, hexes, squares, and dots in teal, aqua, pink, and rose. The formula was smooth and easy to apply. It is a bit on the sheer side, but was easily built up. I absolutely adore this shade! Shown is three coats of Blue Jean Baby. Boots and Bows is a pale pink crelly with multi-sized grey and pink hexes. The formula was smooth and easy to apply. This one is also a bit sheer, but I was really surprised at how opaque it was after three thin coats, since it's such a light color. 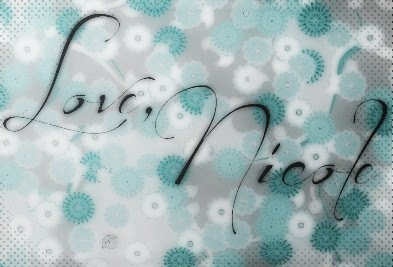 I love how delicate this one is! Shown is three coats of Boots and Bows. Chicks in the Hen House is a soft white crelly with multi-sized hexes and dots in grey, purple, and yellow. The formula was smooth and easy to apply. If you're going for a crisp look with this one, you might want to use a white base. But, if you're going for something softer, this one is easy to build up. Shown is three coats of Chicks in the Hen House. 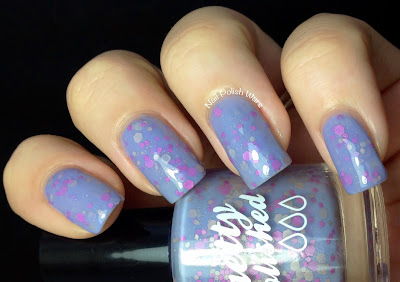 In Love with the Farmer's Daughter is a medium purple crelly with multi-sized hexes in purple and taupe-ish grey. The formula was smooth and easy to apple. It is such a pretty shade!! Shown is two coats of In Love with the Farmer's Daughter. You can find these and other great shades at the Pretty & Polished storefront here, and be sure to check them out on Facebook for all of their latest collections and updates. LOVE that pink and grey one!